The use of lasers for medical purposes is not new. Lasers have been in use for medical purposes for many years and the physics, chemistry, and biology of laser light interaction with human tissue are well documented. Medical uses range from surgery using high-powered lasers to stimulation of tissue repair. 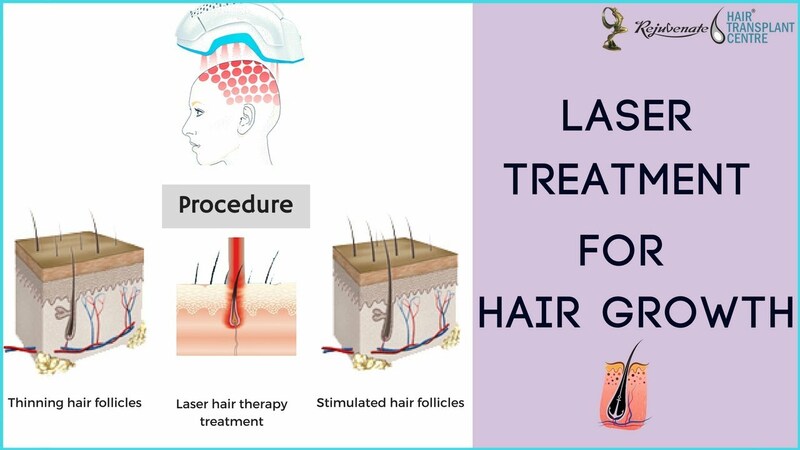 Use of laser light as a hair replacement therapy for treatment of hereditary hair loss is a newer application of laser technology. 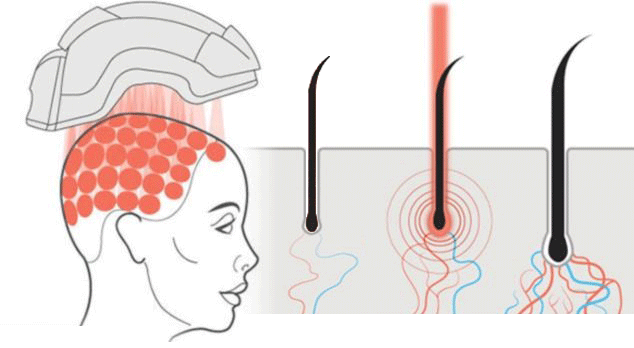 Laser light generated by low-powered (cold) lasers have recently come into use as a non-surgical hair restoration treatmentfor pattern hair loss. Hand-held “comb”, “brush” or “cap” laser devices are marketed for use at home. Larger “hood” or “cap” devices are used in hair restoration clinics. Laser light is not approved or recommended for treatment of hair loss due to any other cause. Click on Hair Loss and Hair Restoration: Unraveling the Secrets of the Hair Cycle. If the cause of hair loss is questionable, you should see a physician hair restoration specialist for appropriate examination and diagnosis before using an LLLT laser. The “cold” lasers used as a hair replacement therapy for the treatment of androgenetic alopecia deliver what is called low-level laser therapy (LLLT). The LLLT lasers are called “cold” because their light is absorbed by target tissue but does not heat the target tissue as occurs with lasers used to cut and remodel tissue. The interaction between laser light and living tissue is defined as photo-biology. Photobiology can be subdivided into laser-tissue reactions defined as photochemistry and photophysics that is, stimulation of chemical or physical reactions by laser light. The use of light of any wavelength for medical purposes is defined as phototherapy. In mitochondria cytochrome c oxidase is associated with are increased ATP production and modulation of reactive oxygen species, which can induce transcription factors that activate genes and produce proteins useful to the cell. The latter can result in increased cell proliferation and migration, production of growth factors (i.e., nerve growth factor), production of inflammatory mediators and cytokines, as well as increases in tissue oxygen. There is some evidence to suggest it may even play a role in modulating 5- alpha reductase. Specially in regard to hair growth, it is postulated these cellular effects result in stimulation of anagen re-entry, prolongation of the anagen phase, proliferation of anagen hair follicles and prevention of premature catagen. Why is visible red light in the narrow spectrum of 630-670 nanometers and low power crucial for treatment of pattern hair loss? 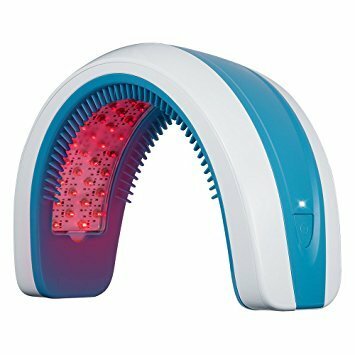 The answer is: because the red light in that narrow spectrum at low power is absorbed by hair follicle molecules critical to stimulating hair growth or regrowth. Absorption of light by the hair follicle molecules is essential in order for the biological reaction to be stimulated in the molecules. If a light is not absorbed, no photo-biological reaction will occur. An accidental observation in laboratory mice in 1967 led to the discovery that visible red laser light stimulates hair growth. A Hungarian scientist investigating the effect of laser light in treating skin cancer noticed that hair grew back more quickly on the skin of shaved mice treated with visible red laser light. LLLT does not stimulate hair regrowth in every person. If intracellular molecules are unable to absorb laser light, or unable to adequately respond to absorbed light, no stimulation of hair regrowth will occur. Experience has shown that stimulation of hair regrowth by LLLT is more likely to occur when hair loss is minimal to moderate, less likely when hair loss is major and/or long standing. Physician hair restoration specialists who use LLLT in a treatment plan for a patient’s pattern hair loss have often noted that LLLT is more effective when used in conjunction with other medical therapies such as minoxidil or finasteride. LLLT is not a “one time only” treatment for pattern hair loss. As with other medical therapies, treatment must be repeated at intervals to maintain hair regrowth results. Hair transplantation is the only permanent treatment for pattern hair loss.